Our Easy Access Mobile Safety Steps have been load tested in 2018 by a UK specialist lifting equipment testing & design company who are members of the Lifting Equipment Engineers Association. The access steps / mobile stairs were tested to a max. load of 225 KG evenly distributed on the platform applied using calibrated test weights. As far as we are aware, no other manufacturer tests to these vigorous standards. All our steps are manufactured to order, therefore please check all dimensions thoroughly as we are unable to accept any returns. These mobile steps aren't called 'Easy Access' for no reason; they are fitted with handlebars, which allows the operator to move them 'wheelbarrow' style to wherever they are needed, and make it easy to access platforms in any location. This easy lift and push movement is one of the reasons this kind of platform step ladder is one of their best sellers. The rubber wheels are durable and the rubber-covered feet ensure that the unit won't slip and slide when in use. 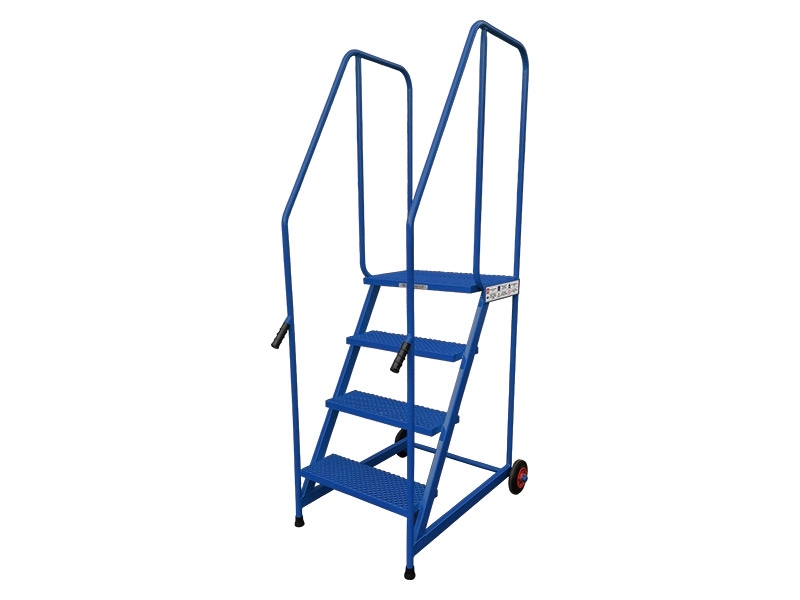 This makes these mobile safety steps more stable than a conventional step ladder, and present the user with a sturdy work platform. 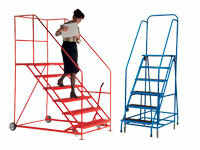 The Easy Access Steps available in two attractive high visibility painted finishes; red and blue. These portable steps are available with 3, 4 or 5 treads these safety steps have an all welded steel construction for stability and punched metal treads for grip. The handrails on either side are 950mm high, offering additional steadiness when ascending and descending the stairs. These mobile platform steps have an open front as standard which makes them ideal for mounting and dismounting higher levels such as flat bed lorries in a safe manner, but a closed front option is available upon request. What is the purpose of Easy-Access Mobile Safety Steps? Working in elevated places is often a recipe for workplace accidents. The wrong equipment can not only lead to personal injury, but also damage to expensive equipment and goods. It is recommended, therefore, that this product be used when there is a need to have access to high places such as warehouse or supermarket shelves, during regular maintenance of pre-installed and elevated equipment and for a variety of other high-access needs. The mobility provided by the two wheels makes this product easy to move about when required, while the rubber ‘feet’ on the other two floor-contact points provides adequate stability while the product is in use. These steps are a great kind of warehouse ladder to have in any environment where high level storage needs to be accessed. 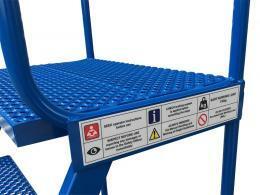 Platform steps can be easily used and accessed by employees, and will enable them to reach high up objects with ease. Where can Easy-Access Mobile Safety Steps be used? For any working height of over 5 feet, this product is ideal. It can be used for stacking in warehouses, access to high supermarket shelves, in libraries, stocking areas, for maintenance needs or in any other place where safe elevation needs to be achieved to complete a job. Though designed with shelf access in mind, the unit can be used wherever there is a need for personnel to climb up to a level that is not otherwise accessible. It can be used in large or small spaces because of its sleek but stable design and, therefore, is ideal for all sorts of requirements including electrical or industrial maintenance needs. Who might use mobile stairs? Safety supervisors will invariably love the stability that these mobile steps can provide, as they will the wheelbarrow-like manoeuvrability provided by the ergonomically placed handle bars. Every warehouse supervisor or maintenance in-charge should have at least one of these at their disposal at all times. Maintenance work isn’t always done at a convenient height and, as such, this product provides the ideal mobile elevation capability that will be highly valued by a vast range of users. This special design has been load-tested to the highest lifting equipment engineering standards possible, and will make workplace safety a sure bet. This product is available in three heights, depending on the number of steps required – 3, 4 or 5. Maximum height option is 1270mm. Non-slip rubber feet and tyres ensure maximum stability even on low-friction floors. This product is covered by a standard one-year parts and labour warranty and is manufactured in the UK to the highest applicable safety and manufacturing standards for such a product. The mobile safety steps range of products from The Workplace Depot are tested by Pegasus Mechanical Lifting of Leicester, a prominent member of the Lifting Equipment Engineers Association.